Dyrehaven (Deer Park) is a large, cultivated forest near Copenhagen, and very popular for nature lovers to walk, bike or horseback. There are 13 different entrances to the park and the road goes through the famous red wooden doors. If you come from Copenhagen, there is a subway station and parking by Klampenborg station. True romantics take a horse-driven waggon to the picnic spot. There are more than 1,000 hectares in Dyrehaven and here you can meet red deer, fallow deer and Sika Deer. In 1670 Frederick III appointed the area hunting ground for his son Christian V (not humanitarians obviously!). In the 1760 the German forester Johann G. von Lange introduced new mixtures of trees. Many of the trees in Dyrehaven dates back to this time. 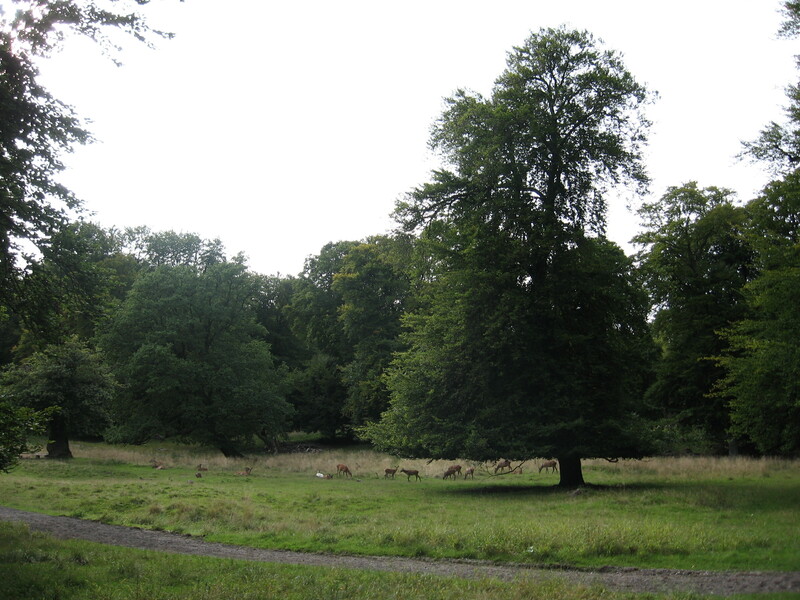 Dyrehaven is known for the great plains, where you can see deers that grasses interspersed with small groups of trees of oak, beech and hawthorn. In the garden’s southern end and within walking distance from Klampenborg Station you find Bakken. One of the world’s oldest amusement parks with both rroller-coasters carousels and a lot of other attractions as well as pubs and restaurants. Bakken is open from late March to late September. On the above picture you see Dyrehaven on a beautiful day in September with deers in the background.